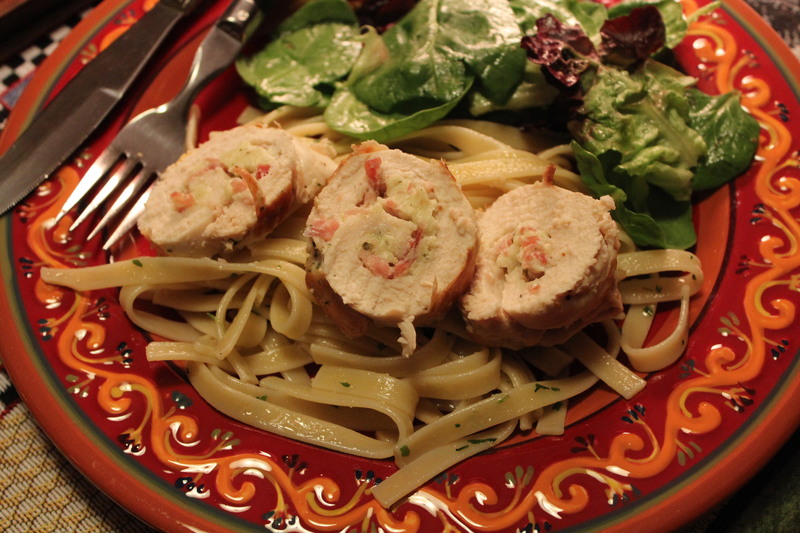 Chicken Roulade served over fettuccine. I would hazard a guess that chicken in some form is on your table at least once a week, ( with the exception of non-meat eaters). I know its on our menu on a regular basis; so with that amount of frequency I am always on the lookout for a new way to cook it. I’m not a person who is satisfied with the same old, same old. Variety is the spice of my life. 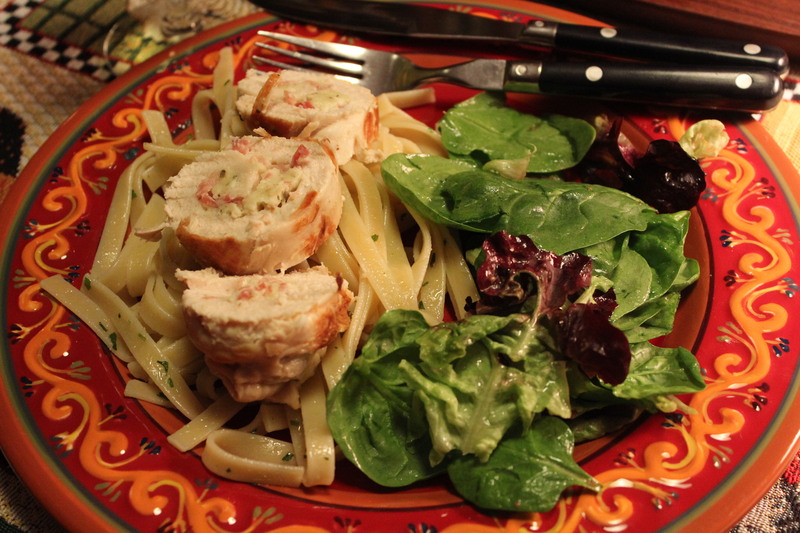 Therefore when I came across this recipe which first of all was described as “quick and easy”, but secondly called for a filling rolled up in a boneless chicken breast I was immediately interested. Roulade is a French term for a thin cut of meat that is stuffed, rolled, then browned before being roasted or braised. In this case the stuffing consists of a garlic and herb spreadable cheese and some prosciutto. rolled up inside a thinly pounded boneless chicken breast. The chicken is browned, then braised in a light wine sauce and served over fettuccine. Let’s face it sometimes white meat chicken can be pretty bland, but the flavors in the filling here were a nice contrast to the chicken; a little salty, a little smoky, and a little cheesy. All in all I think this chicken dish is one you would be proud to serve to guests. While the recipe was not as quick and easy as the recipe would lead you to expect, it certainly was not hard, nor lengthy to prepare. 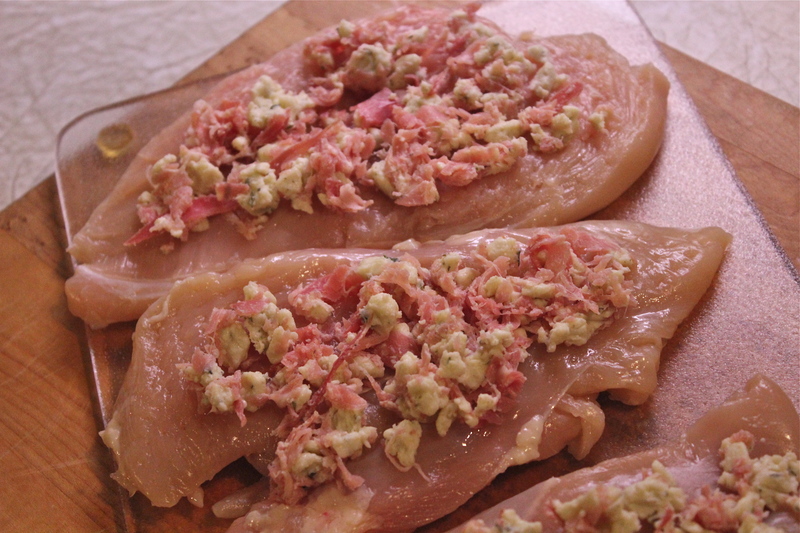 Start by pounding the chicken breasts well between two sheets of plastic wrap, then spread each one with the mixture of herbed cheese and chopped prosciutto. Roll up and tie in a couple places with kitchen twine to keep them rolled while you brown them, then add a little wine to braise/cook them to completion. While this is going on, boil a pot of water and cook the fettuccine. Make a salad to go with it and your meal is complete. I would serve this to guests because when plated it is quite impressive, and besides that it tastes really good! 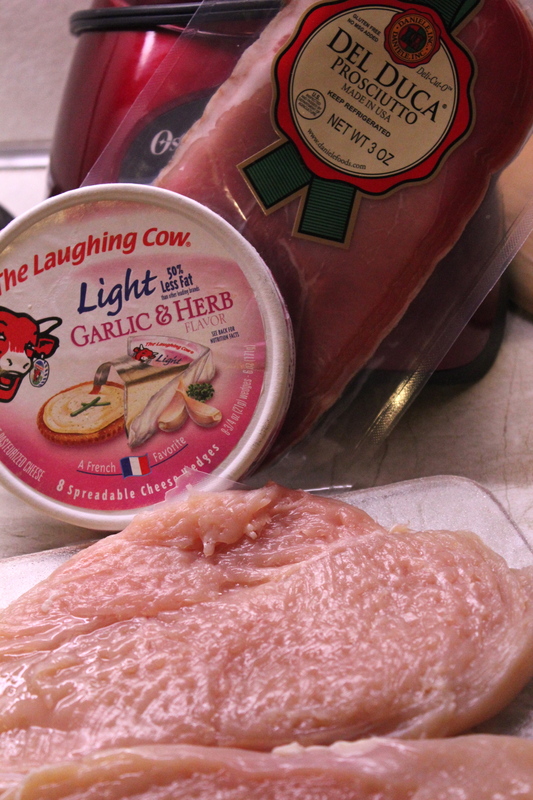 Please note that in my version I used Laughing Cow garlic and herb wedges, because I couldn’t find a spreadable cheese like the one called for. My filling was more crumbly than spreadable but it worked out well all the same, and kind of melted together as it cooked. An herb and garlic cheese and prosciutto make the filling. 1. 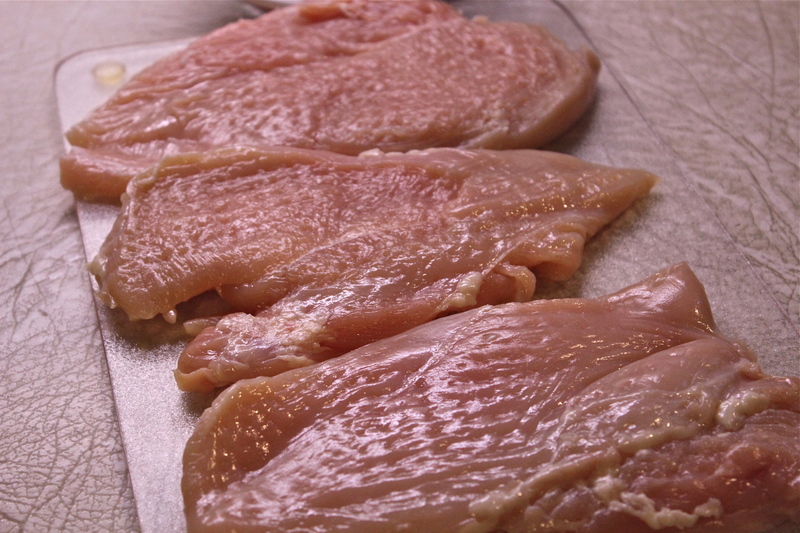 Place each chicken breast half between 2 sheets of plastic wrap; pound each piece to 1/4 inch thickness using a meat mallet. Sprinkle both sides of chicken with 1/2 teaspoon salt and pepper. Pound chicken out to about 1/4 inch thickness. 2. Combine cheese and prosciutto in a small bowl. Spread 1 1/2 teaspoon cheese mixture over each breast half. Spread a small amount of filling on each chicken breast. Roll up chicken, jelly-roll fashion, starting with narrow end. 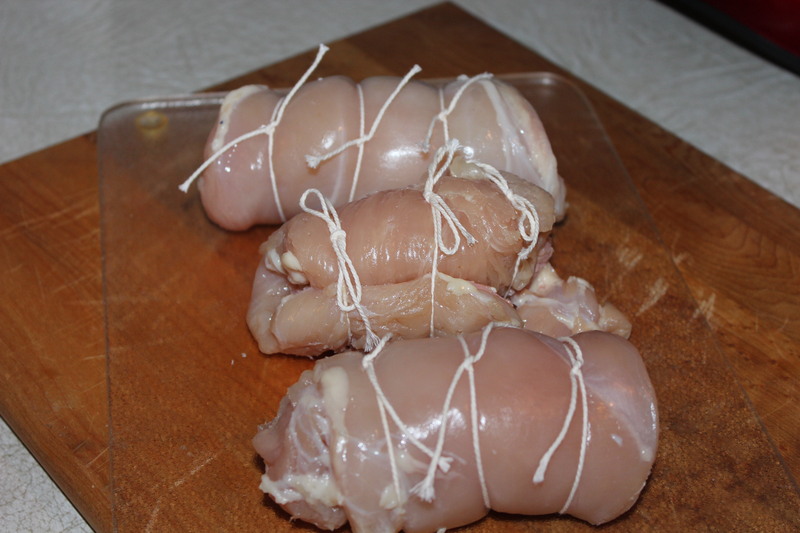 Secure chicken rolls in several places with twine. Set aside. Rolled, tied and ready for browning. 3. Meanwhile start a pot of salted water to boiling and cook pasta according to package directions. Drain well Place pasta in a large bowl. Sprinkle with parsley and drizzle with 2 teaspoons olive oil; toss gently to coat. Cover and keep warm. 4. Heat 2 teaspoons oil in a large non-stick skillet over medium-high heat. 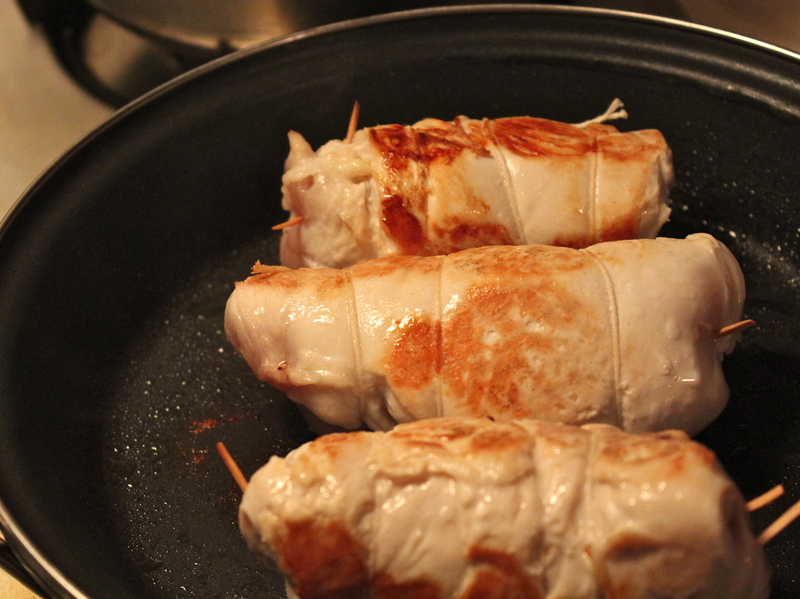 Place chicken in pan, and cook 6 minutes, browning on all sides. Brown well before adding wine and water. Add wine and water. Cover, reduce heat to medium-low, and cook 6 minutes more or until chicken is done. Remove chicken from pan, and let stand 2 minutes. Remove twine, and cut each roulade crosswise into 5 equal pieces. 5. 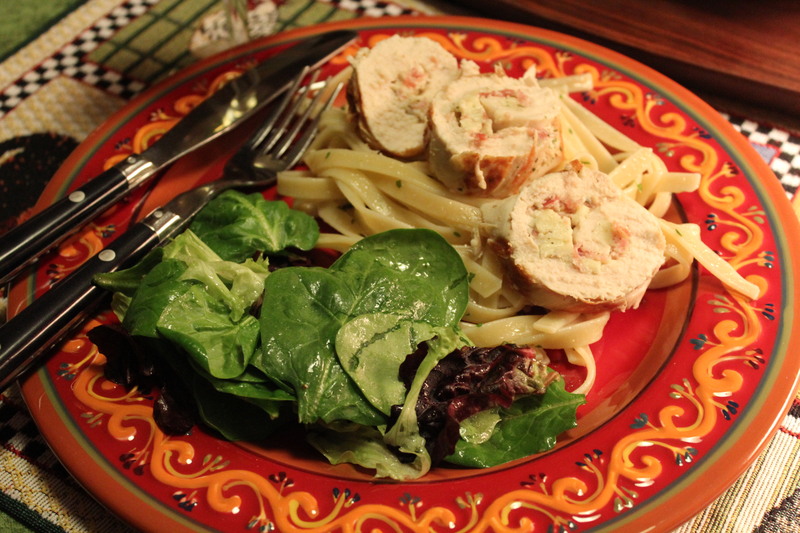 To serve: place about 1 cup pasta mixture on each of 4 plates; top each with 5 pieces roulade. Serve immediately. Plated and served with a green salad. I felt that this meal needed some sort of green vegetable to complete it, so I made a spinach salad to go along with it. Since I made this whole recipe for only 2 of us, we had chicken left over which I placed on top of a mixed garden salad for lunch the next day. A delicious lunch and great way to use up the chicken.